Have you met the Windsors? 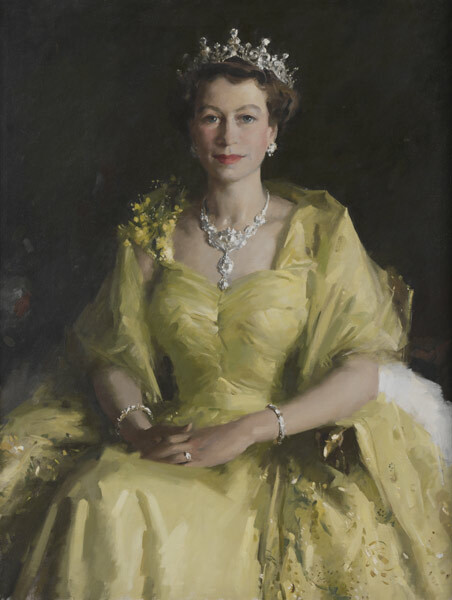 Portrait of Queen Elizabeth II, 1954, oil on canvas. Image: Parliamentary Art Collection. I have great respect for Her Majesty the Queen. I’m also pretty sure we should be a republic. But like a moth to a flame, and with the excuse that my daughter might never lay eyes on her again, I was drawn to the Lake to watch HM whoosh by in a motor launch, radiant in well-chosen pastels and a large hat. As the Duke and Duchess of Sussex (and their sprog-to-be) cause the latest flurry of royal hysteria, why do people get so excited about the Windsors? Here in the national capital, we’ve had a long history of royal visits. At the height of her fairytale fame back in the early 80’s, Princess Diana was here in a feathery hat and pearl choker. Photos show the royal couple being shown through the Botanic Gardens, meeting children at Erindale Primary, and shaking hands with the locals in Civic Square. Scott Sadler, the executive manager of the National Arboretum, had no particular opinions about the royal family until he found himself meeting Prince Charles and the Duchess of Cornwall in 2015 when their Royal Highnesses visited to plant a Pin oak ‘Freefall’ tree, bred by Canberra plantsman and former Botanic Gardens director Robert Boden. “We had one older volunteer, a really special person, and she couldn’t get anywhere near Prince Charles. She was so distressed, so as we were leaving I said “There’s a lady who’s been a fan of yours since you were born. Is there any chance you could say hello?” He pushed past two people to shake her hand. She went wobbly at the knees and started crying. I thought that was pretty special”. National Arboretum foundation chair John Mackay jokes that ” If Jack the Ripper came to Canberra, I’d meet him”. He says of royal visits past, “I formed the view that if the royals come to Canberra, you have two choices. You can knock over several little old ladies in front of you to get to her and thrust out your hand, or you stand at the rear. I chose the latter option”. Michael Cooney, National Director of the Australian Republican Movement, says it’s fine to get excited in the moment. “This visit is a picture of the future with an Australian republic. We have a British royal visiting who is not a head of state, here for the Invictus Games. People from all sorts of places will be at the Games, it will be fun and inspiring, and as far as connecting with the royal family goes, it’s what the future will look like. In a way, that’s exactly what we want”. Have you met one of the royal family? Would you like to meet them if you had the chance? What’s your Windsor story?